Sheryl Sandberg & Beyonce Want You To Stop Calling Girls "Bossy"
Sheryl Sandberg wants us all to stop calling strong, confident girls “bossy”, and she’s not alone. 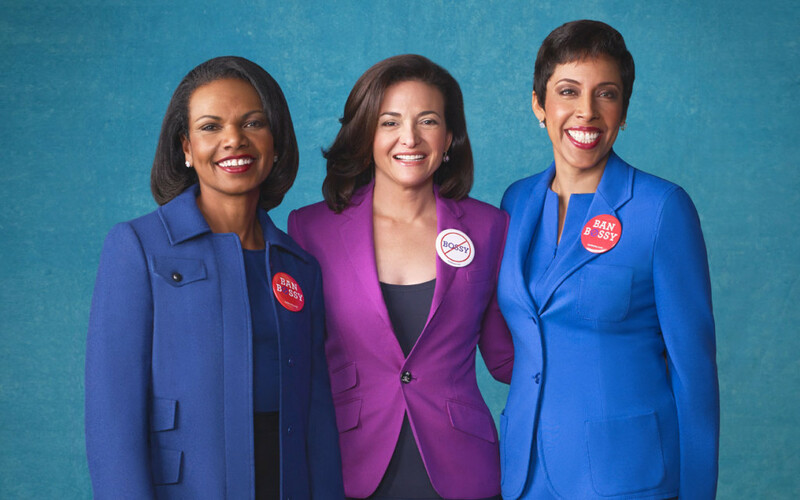 She is part of a major campaign called ‘Ban Bossy‘ with former Secretary of State Condoleeza Rise, and Girl Scouts USA CEO Anna Maria Chavez to encourage leadership skills in women from a young age, and by banning that “B” word hopefully break down barriers that stop these girls from being more ambitious. The Facebook COO, 44, who is also part of a record-breaking list of female billionaires in 2014, says this falls in line with her ‘Lean In’ movement which stems from experiences she had when she was in school. She told Parade magazine that her own leadership traits were not encourages by her teachers, who said “She’s too aggressive, too bossy.” She was advised: “You don’t want to be bossy.” Good thing she didn’t listen! Today ‘Lean In’ is helping countless women around the world gain a fresh perspective on how to balance work and life, as well as allowing them to have the confidence to climb the corporate ladder without apologies. Condoleeza Rice, 59, had a different experience with her assertiveness growing up. “My parents elected me president of the family when I was 4… I would call meetings where we’d decide things like what color to paint the living room. As I got older, I realized that what my parents were doing was sending messages about leadership potential,” She tells Parade. Anna Maria, 45, says her upbringing could’ve been seen as unconventional, but it has certainly paid off. “Instead of teaching me how to cook, my mother taught my brothers how to cook, and me how to run a board meeting. She was an elected official, and she used to take me to meetings so I could see how leadership played out.” But her family situation was a huge anomaly at the time. Hold up there! Imagine if more mothers invested time in teaching the boys of their family to cook and clean just as much as the women. And imagine if more parents were invested in encouraging girls to be leaders? This is exactly what this campaign hopes to achieve. Sheryl says it is hard to break down the stereotypes which come along with the word bossy, for women especially. “Women still represent only 5 percent of Fortune 500 CEOs. And more worrisome is that the number has been stagnant for a decade. What hasn’t changed fast enough is our acceptance and encouragement of female leadership,” Says Sheryl. So are girls ready to lead? According to these women, yes! And it seems the world wants to see more well-equipped females to take charge and run things differently that what we are used to. “What has always made our country special is that it doesn’t matter where you come from; it matters where you’re going. Our job is to make certain the pathways are open to both our boys and our girls.” says Condoleeza. So how does banning the word “bossy” make a huge difference in raising up young female leaders? Of course the question of a female US president comes up throughout the conversation. “If we’re going to fix the pipeline from statehouse to president, we have to start young. One of the reasons I wrote ‘Lean In’ is that my daughter, when she was 4, asked me, “Mommy, why are all the presidents boys?” Sheryl said. “The day has to come when it’s not a surprise that a woman has a powerful position. We’ve actually had three women secretaries of state, and people still say, ‘female secretary of state.’ ” Condoleeza points out. The idea of this important campaign is not to compete with boys or take away from what they are doing, but rather to show ways where both men and women can work together complimentary. In fact, there are already a number of celebrities on board including actresses Jennifer Garner and Jane Lynch, designer Diane Von Furstenberg, singer Beyonce, as well as a few men who are on board with banning bossy. The video below shows NASCAR champion Jimmy Johnson and Arne Duncan the US Secretary of Education, who agree that women need to be encouraged in leadership. “When we talk about investing in girls, we’re not saying to divest from boys. It’s about ensuring that we have every capable person prepared to lead. This country has some serious problems. We need every brain cell around our decision-making tables.” says Anna Maria Chavez. “Women are 50 percent of the population, so I want them to have 50 percent of the leadership roles in every industry, at every level. And I’d like to see men doing half of what needs to happen in their homes. That will make a huge difference.” says Sheryl. That is almost a no-brainer, yet we still need to fight for it to happen. “Believe in yourself, because the world will not always encourage you,” says Sheryl. “Leadership is hard because everybody who doesn’t actually want to do it wants to tell you how to do it. You’d better have thick skin.” says Condoleeza, clearly speaking from experience. “I’m not bossy, I’m the boss,” says Beyonce in the promo video. Perhaps this is a great way to change our perspective on the term. Thinking of women as THE boss. Pingback: GirlTalkHQHey Ladies, Let's Talk About Your "Favorite Female Positions"